This week, we were also treated to two speeches for the Canadian Parents for French activity “Concours d’art oratoire.” Bravo to Ryan and Ebony for presenting their French speeches in front of all the Grade 7 students. In French with 7F1, we continued to learn about le passé composé. In English with 7F1 and 7F2, we wrote, in groups, a paragraph called “Ice Storm” to practice using a graphic organizer to write a cause-and-effect paragraph. Being able to use the cause and effect structure will be helpful when students begin to write their non-fiction feature articles very shortly. 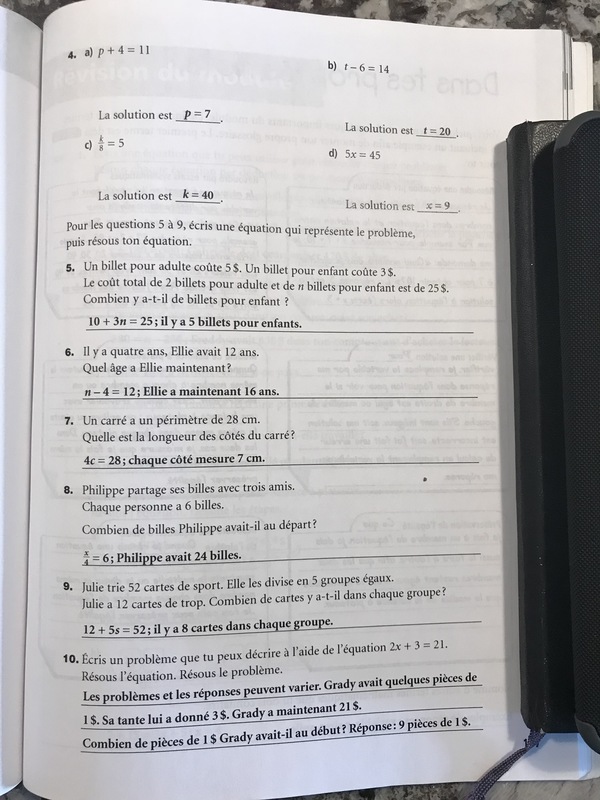 Finally, in Mathématiques with 7F2, we began some problem-solving tasks and continued to learn the steps to solve an equation. My apologies for not publishing a learning snapshot last week. Here’s a summary of our last two weeks. 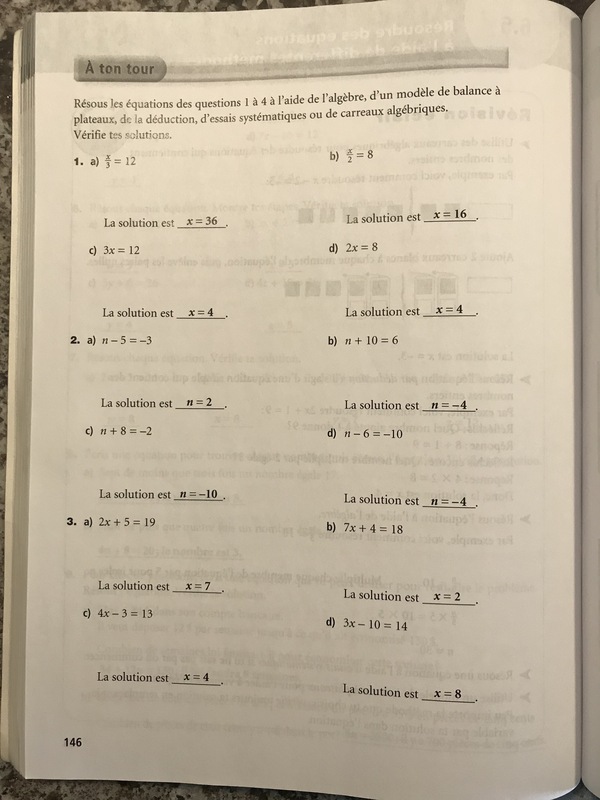 We have begun a new unit on equations in Mathématiques with 7F2. We began by learning how to represent an equation using math manipulative materials. Using concrete materials helps students see what happens when we isolate x on one size of an equation, for example. Once we have mastered that, we move on to drawing images and using symbols (i.e. numbers) – but building the conceptual understanding needs to come first. We have also been finishing the collection of evidence for the Grade 7 Provincial Assessment of Key Competencies in Mathematics. Results will be shared in the Term 2 report card. Of course, finishing the provincial assessment does not mean that we never review those competencies again. If students are approaching or not-yet-meeting mid-Grade 7 standards, they will continue to receive extra help. NEW! All Grade 7 Math students are invited to the extra help sessions scheduled on Wednesdays from 12:10-12:45 in Room 207, with M. Sorokowski and Mme Chagnon. Students can work on assignments or get help with specific concepts. In other news, we’ve accomplished a fair bit in English (7F1 & 7F2). Students chose to publish either their enumerative or sequential paragraphs on the iPad and will present their published work on Tuesday, February 19. Students also finished their compare/contrast paragraphs and began to study the cause-and-effect structure. In a week or so, we will begin writing our final non-fiction feature article, which will incorporate each of the skills we have been practicing during this unit. We also saw the return of What’s Going on in this Picture and our short film studies. We watched “The Invention of Love,” which you can see below. Both activities work on inferring, communicating, and critical thinking skills. Invention of Love (2010) – Animated Short Film from Mot & Co on Vimeo. Finally, in Français with 7F1, we began to learn about le passé composé and l’imparfait, the most commonly used past-tense verb forms. We saw once again that verbs follow patterns, and finding these patterns is the best way to remember them…as opposed to cramming them into your memory! We also completed the Les prisonniers du zoo novel study. Over the next week, we will complete a few other activities to go along with this group, including a critical thinking exercise to do with animal testing and whether it is ethical. We will also return to look at the narrative structure of Les prisonniers du zoo, as our next writing task involves creating a well structured short story. Students also each chose a novel out of our French classroom library and have been reading it during reading time. As I always say, you can’t get better at reading in French unless you read more in French! Have a great weekend – check out Festival du Voyageur perhaps? – and happy reading! Can you believe it is already February? That means it is time for I Love to Read month. The school’s student leadership team has prepared a great month of activities, which you can see in the calendar below. This week in class, we worked on compare and contrast structures this week in English (7F1 & 7F2) as part of our text structures and feature article unit. In French (7F1), CFOO-A presented and read some more of Les prisonniers du zoo. We are almost done the book, which means we are getting ready to write stories of our own. 7F1 has the opportunity to collaborate with some of M. Bodnar’s technology classes. We will write stories that accompany the tech classes’ photos. This will also give us an authentic way to learn about le passé composé and l’imparfait, two verb tenses. Finally, in Mathématiques (7F2), we continued to learn about integers. This time, we practiced subtracting integers using math manipulatives and number lines. We will generalize about the patterns we have begun to notice this coming week. We were also treated this week to a field trip to the divisional musical theatre’s production of Seussical, Jr. So many Knights were part of Cast 2, which we saw on Wednesday! I also attended a performance on Sunday to see Cast 1. What talent! Bravo!